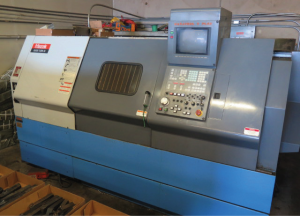 1995 Mazak “Quick Turn 20” CNC Turning Center s/n 116649 w/ Mazatrol T-Plus Controls, Tool Presetter, 8-Station Turret, Hydraulic Tailstock, 8” 3-Jaw Power Chuck, Coolant. Mazak “Quick Turn 30” CNC Turning Center s/n 126948 w/ Mazatrol T Plus Controls, 8-Station Turret,Hydraulic Tailstock, 12” 3-Jaw Power Chuck, Coolant (TOOL PRESETTER BROKEN). Mazak VQC 15/40 Sliding Column CNC Vertical Machining Center s/n 73466 w/ Mazatrol M-32 Controls,16-Station ATC, CAT-40 Taper Spindle, 16” x 35 ½” Table, Coolant. 1991 Mazak VTC-41 Sliding Column CNC Vertical Machining Center s/n 98181 w/ Mazatrol EIC Controls,24-Station ATC, CAT-40 Taper Spindle, 16” x 35 ½” Table, Coolant. Takisawa “MAC-3V” 4-Axis CNC Vertical Machining Center s/n TMELY3087 w/ Fanuc System 6M Controls, 18-Station ATC, BT-40 Taper Spindle, 15 ¾” x 23 ¾” Table, Coolant (ZERO RETURN PROBLEM). 1995 Mazak VTC-16C Sliding Column Twin Turret CNC Vertical Machining Center (FOR PARTS) w/Mazatrol M32B Controls, (2) 24-Station ATC’s, CAT-40 Taper Spindle, 16” x 79” Table. Nam Seon Acra Turn 16X40 16” x 40” Geared Head Gap Bed Lathe s/n 40100271 w/ Sargon DRO, 20-1500 RPM, Inch/mm Threading, Tailstock, 5C Collet Closer, 8” 3-Jaw Chuck, Coolant. Acra AM-2V Vertical Mill s/n 970084 w/ Sony Millman DRO, Mitutoyo Digital “Z” Scale, 3Hp Motor, 60-4200 Dial Change RPM, Chrome Ways, Power Feed, 9” x 42” Table. J&amp;L / Arfa mdl. MBS-71200M 7” Horizontal Band Saw s/n 172014. Campbell Hausfeld MIG-FLUX 105 MIG Welder. Craftsman 1Hp Pedestal Drill Press. Standard 12-Speed Pedestal Drill Press. (2) Makita 14” Abrasive Cutoff Saws. 5Hp Vertical Air Compressor w/ 60 Gallon Tank. Craftsman 6Hp Portable Air Compressor. Hydraulic Test Stands and Acces. Haas 4 th Axis 5C Rotary Head w/ Haas Servo Controller, (3) 6” Angle-Lock Vises, (70) CAT-40 Taper Tooling, (2) 40-Taper Tooling Carts, 5C Collet Nose (Mazak), KDK Tool Post and Tool Holders, 8” 4-Jaw Chuck, Flex Collets, 5C Indexing Head, 5C Collet Closers and Collet Block Set, (200) 5C Collets and Racks, Insert Mill, Turning and Boring Tooling w/ Carbide Inserts, Central Hydraulics 4 Tom Hydraulic Ram Set, Carbide and HS Endmills, Drills, Reamers, Porting Tools and Key-Way Cutters. Mitutoyo PH-3500 14” Optical Comparator s/n 750161 w/ Mitutoyo UDR-220 Programmable DRO, Digital Angular Readout, Surface and Profile Illumination, Base Stand. Brown &amp; Sharpe 18” Height Master w/ 10” Riser Base, Mitutoyo 18” Dial Height Gage, Starrett 26” Vernier Height Gage; Gage Block Sets, Import 0-12” OD Mic Set, Mueller Dial Groove Gage, OD Mics to 6”; Mitutoyo Depth Mics; Dial Depth Gages, Dial Test and Dial Drop Indicators, Dial Caliper Gages, Dial and Vernier Calipers, Pin Gage Sets to .750”, Deltronic Gage Pin Sets, Granite Indicator Bases w/ Dial Indicators, 24” x 36” x 5” Granite Surface Plate w/ Stand, Precision 18” x 24” x 3” Granite Surface Plate. 1995 Mercedes SL320 Convertible Lisc# 4FFJ420 w/ 6-Cylinder Gas Engine, Automatic Trans, AC, AM/FM/Cass, 163,405 Miles, VIN# WDBFA63EXRF092132. Clark C500-50 5000 Lb Cap LPG Forklift s/n 355-965-3806 w/ 2-Stage Short Mast, 106” Lift Height, Solid Tires. Big Joe Pallet Jack, Hydraulic Engine Hoist and Engine Stand, Large Quantities of Gate and Ball Valves to 4”, Acroprint Time Clock, Homs 300 Lb Cap Beam Scale, Shipping Supplies, Storage Cabinets, Shelving, Work Benches.